After watching a demo on another topic, the speaker used IntelliJ IDEAX and I immediately wanted the app, so I search and downloaded the latest beta. 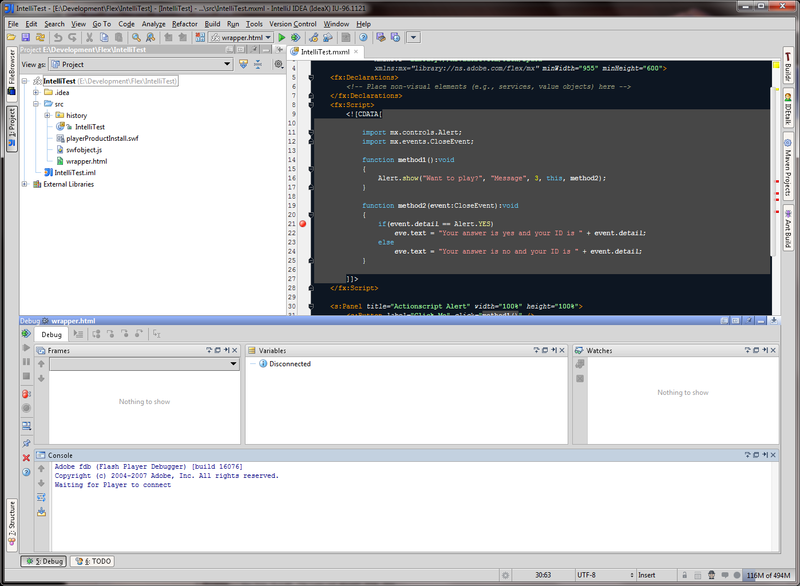 After a small learning curve, I really enjoy using the app, but have been forced to return to Flex IDE for my testing because I can't seem to get IntelliJ to stop at my breakpoints. I've attached an image with my project's configuration. I pretty positive that IntelliJ can debug since I witnessed it within the video, but can't for the life of me figure out the required configuration to get it done. Any help would be greatly appreciated, so I can continue to use IntelliJ and my sole actionscript/flex IDE. 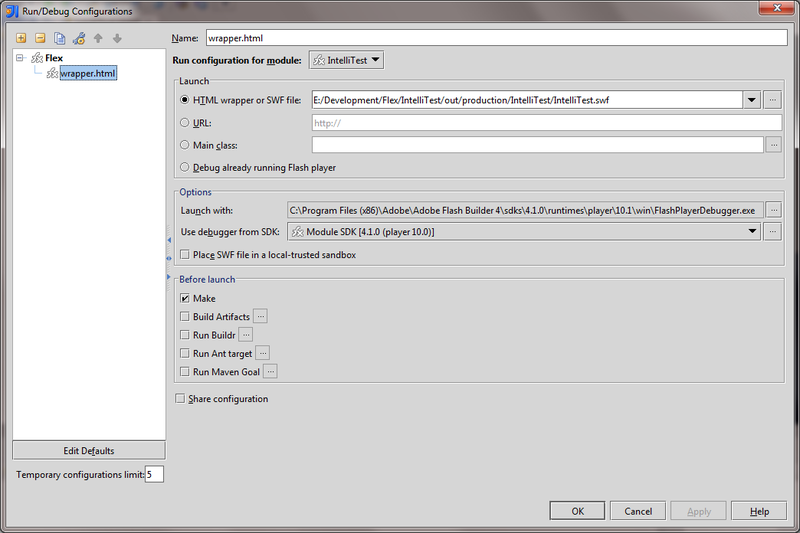 You need to download Flex SDK from Adobe (Adobe Flex SDK, e.g. First, thanks for responding. I previously downloaded the Flex SDK and I can get my application to run, just not able to debug it. You mentioned I should "and run debug enabled flash player for your platform once". As I may have mentioned, I usually use Flex 3 or Flash CS5 for my development. Do I still need to run my app separately and if yes, then will I need to do that for each project I build and want the capability to debug? Again, thanks much for responding. Very frustrating. If I have an open debug session and I run my SWF using the FlashDebugger.exe file, I see a connection within the console panel and the breakpoint stops the application, but I still cannot get that functionality when I simply click on the DEBUG button. I assume I am doing something incorrect with my configuration. Am I suppose to point to the FlashDebug file within my settings for this project? Is this something that is set for IntelliJ? Okay, now I've built the same project using Flash Builder 4 and ran the debugger (FlashDebugger.exe and fdb.exe) and it worked using FB 4. So then I recreate the project in IntelliJ and attempted to test in the exact same location, and again nothing. The console continues to look for the player to connect. I've included a screen shot. Please please please, I'd really like to use the application for our next project, but if I can't quickly set it up, then it won't be easy for my team. I understand that my SDK (debug player) must be registered with Windows, but I've has Flex 3, Flash CS5, and Flash Builder 4 all installed and registered with Windows. They are all working correctly, what am I missing. I decided to go back and in the configuration for the project instead of using System Default Application, I pointed directly to the FlashPlayerDebugger.exe file and selected the SWF in the launch options. The debugger worked that time. So my question is am I suppose to point to the actual debugger file for each project? There's a button 'Edit Defaults' at left-bottom of your screenshot. Press it and then set any values including path to Flash Player. 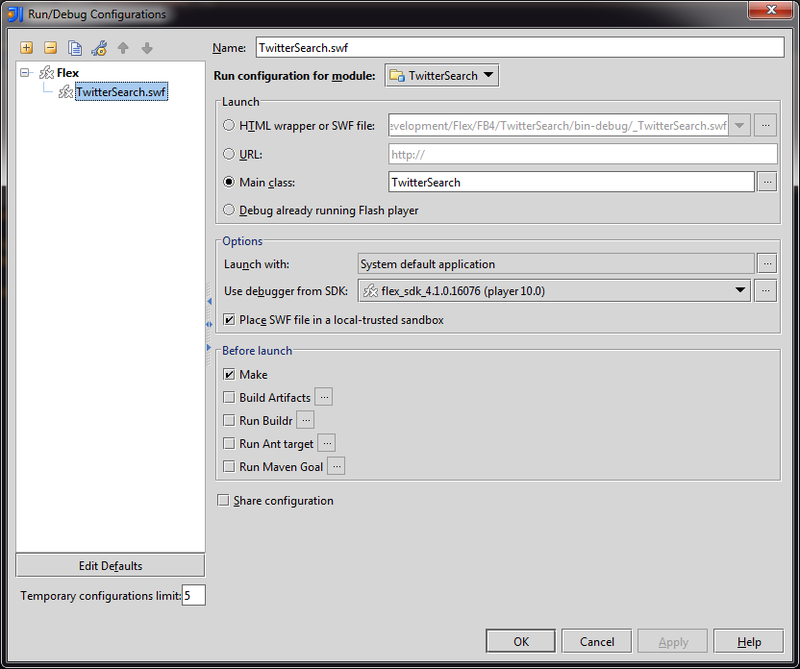 These settings will be used by default for all newly created run configurations in the current project. Unfortunately there's no way to set default values for all newly created projects, but I suppose in real life you don't have dozens of projects. You usually have one or two projects with dozens of modules. Thank you for the information, I saw the button, but wasn't sure if it would remember from project to project. However, I am still experiencing troubles with attempting to debug. Even with the player set as my default, I can't seem to get it to connect when I select the debug button. If I navigate to the debugplayer and have it open the SWF file, then I get a connection and it will allow me to debug, but that is awfully annoying to do every time I want to check a correction. I know it is possible, I just don't know what I am doing wrong. Are there document steps to setting up your IDE to properly debug a SWF? Thanks for the reply, I figured it out. It was completely the user having issues. I verified that I installed the latest debug player and, using IE, I debug using HTML. Everything is running perfectly. Thanks for the reply, this thread can be closed.